We have been blessed with yellow plum bushes in our new garden, they have a richly balanced and aromatic sweet flavor but not as sweet as the smaller mirabelle plums. We really enjoyed this meal, and will be having it often in the future. One hour before making the meal, slice the tempeh and make the marinade. Put the marinade in a low dish and lay the tempeh in the marinade. After 15-30 minutes turn the tempeh pieces over so the other side gets soaked also. Add the chopped onions and saute until they are soft, but not browned. Add the vinegar and raisins and stir to mix. Add the plum jam, pinch of salt and cayenne if using. Stir the chutney and season to taste. Keep warm on a low heat. Heat a frying pan with oil. Add the tempeh and lightly braise each side to a light golden brown. Be careful as sometimes, if there is a lot of marinade still on the pieces, and the oil is very hot, it will spatter. 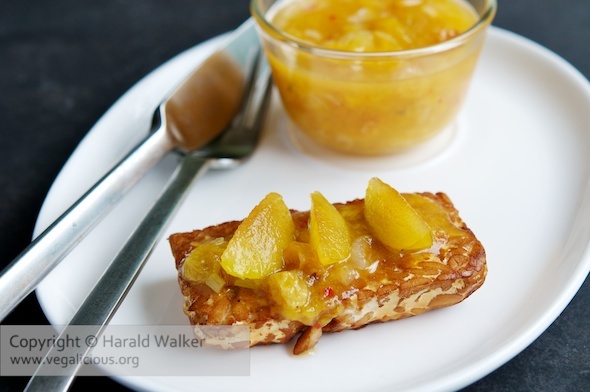 Serve each slice of tempeh with some chutney on top and a few slices of yellow or mirabelle plums. 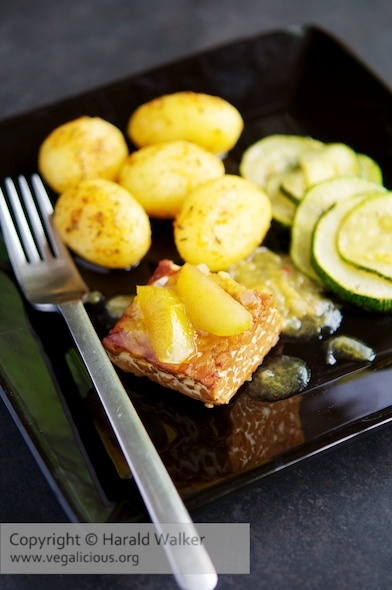 We enjoyed this meal with herbed small potatoes and garlicky sauteed zucchini. We used the Mirabelle (Plum) Jam with vanilla and star anise recipe by Pascale Weeks. You will need to make the jam the day before. Posted by Chris Walker on August 15, 2011 in Main Dishes, Plum, Tempeh.